Summer is the perfect time for sensory water play! We all know that sensory play is such an important chance for children to learn about world. Let them dig into a sensory water play activity where they get to use multiple senses at a time with sensory soup. 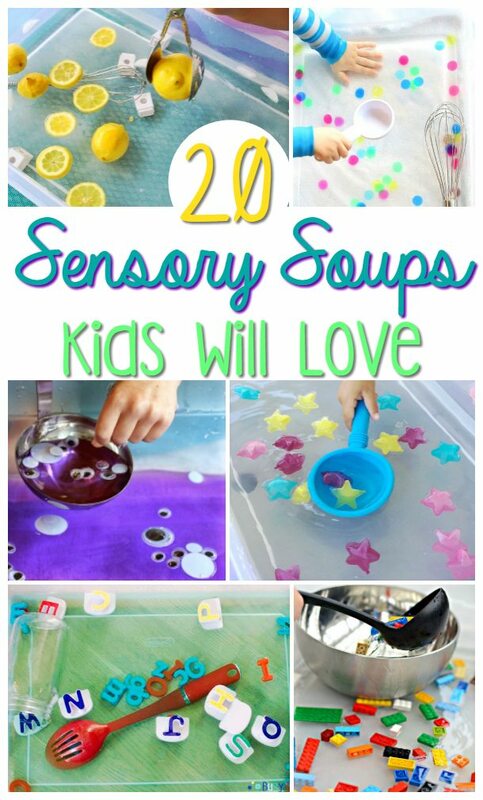 Sensory soups are the water version of sensory bins and oh-so-very fun! I’m always looking for fun Boredom Buster Activities for my kids. 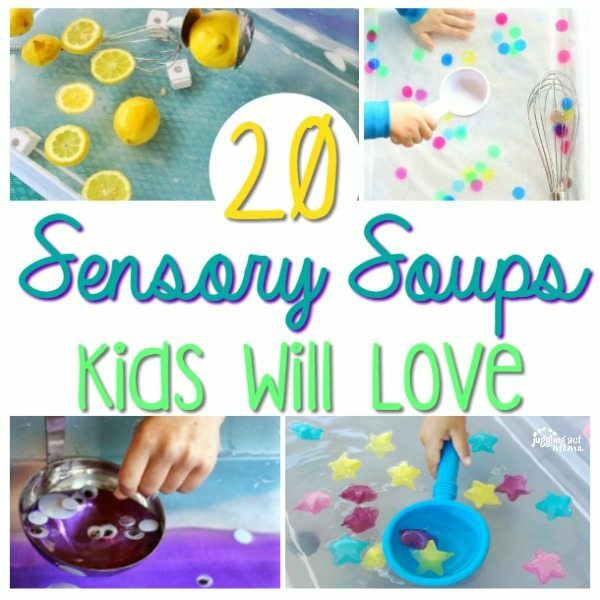 Sensory “soups” are a fun way to keep them busy for a long time, and it’s especially great in the warmer weather. Basically, you’re taking sensory play to the next level by adding water. Start with a container of water and add items to it based on whatever theme you’d like to make. It can be based on a season, a holiday, or something your child loves. Give your child spoons and ladles and other fun utensils for them to play in their ‘soup’ with. Children learn through experiencing the objects as they play. 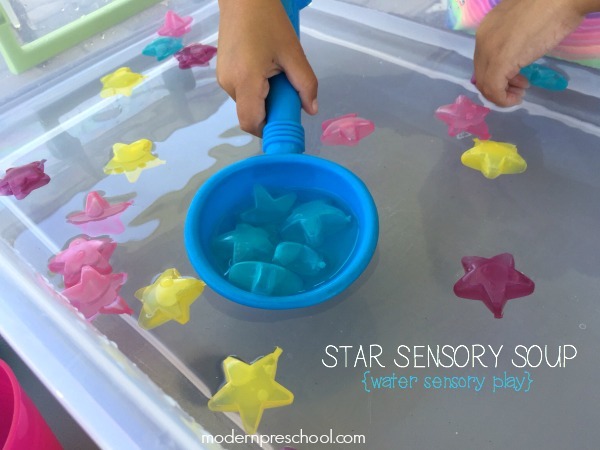 Sensory water play adds a fun element to a traditional sensory bin. The kids will touch the objects, hear what they sound like in and out of the water. You can even add a few drops of essential oils to add another sensory aspect. (Check out my post about the Top 5 Must-Have Essential Oils for Families to get ideas on which to use). Kids love getting their hands wet and playing. Using utensils also helps them build their fine motor skills as they seek to scoop up objects. Here are some of our favorite sensory water play ideas from awesome bloggers who know how important it is to keep curious toddlers busy! 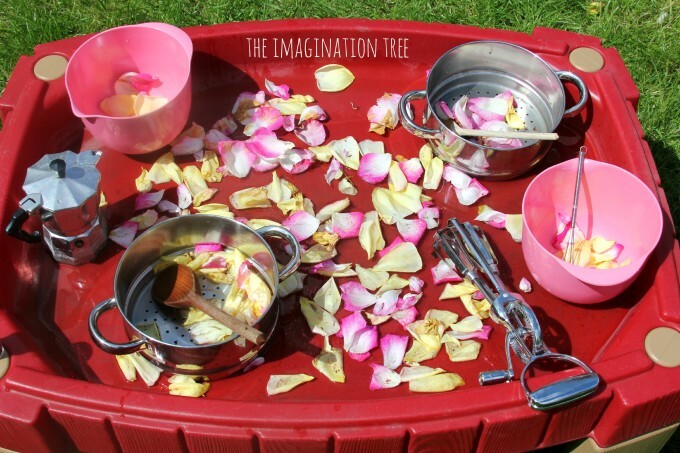 I’m loving all these great sensory water play ideas! Which one is your favorite? It feels like I’m turning into young again.